Here I am with the real “boss” at Bellagio Art to Wear. Winter is over (thank goodness), and it’s time to spring forward—right into some fresh new fashions. We’ve been as busy as ever here, and excited about all we have to offer for this spring and summer season. Dress to Kill, an edgy euro-style collection designed and created by Jane Mohr has arrived, and we’re ready for you come in and try this fresh new fashion line. Dress to Kill features international novelty fabrics and is perfect for work, travel, running around town with your favorite person, or simply lounging. Over the years, the Dress to Kill line has evolved into sophisticated, comfy art-to-wear. It is an absolute must for you to come in, feel the fabric, and try on a few pieces. These beautiful creations will become the highlight of your spring wardrobe. We just returned from our buying trips for the spring and summer. New, fresh brightly colored fabrics will adorn our store. 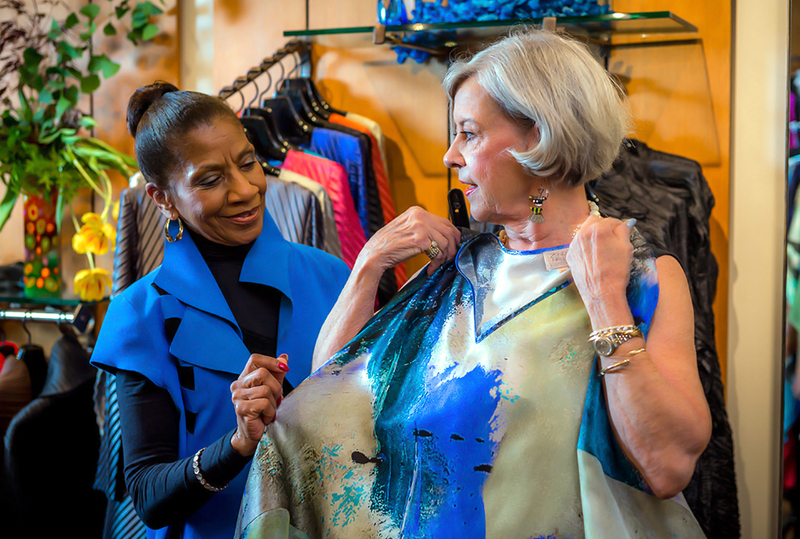 Whether you have your eye on the Sympli spring collection, Kay Chapman shirts, our local artist Michael Kane, or Chris Triola, you will find that perfect color to pick your spirits up and look fabulous: sky, turquoise, pinks, blues, purples, greens and so many more are waiting for you. Oh and yes we have the elegant black. We also selected many new artists for Bellagio for you to consider. Four new jewelers and several garment creators are joining us. Dress To Kill, Yacco Maricard, Hardware Purses by Renee, and Stacy Rodgers are just a few new artists for you to consider. Come in and let us introduce you to the old and new artists we are showing. If you have shopped in our stores, you know we are dog lovers and are dog friendly. On some days, you may come through the front door and see a handsome large standard poodle named Charlie. He is owned by our Sales Associate, Joan Worth. Another day, you may come in and be greeted by Priscilla, a rescue pug mix that just loves people! And I know the favorite of our store is Fidel, a Havenese who is owned by John and me. She is now 15 years old. On our countertops, you will find containers where you can donate to the Asheville Humane Society or Brother Wolf Animal Rescue. Our company loves supporting these organizations. Many of our employees, if asked, will also talk to you passionately about their dogs. Come and explore all the new fashions from Sympli. Whether you are already a fan or have yet to purchase your first Sympli piece, we know you will find something irresistible in this collection. Be sure and make time to stop by during the weekend of May 4-7 to check it out.